Capstone Projects are designed to integrate all elements of the MET curriculum. These design projects done by the UALR junior/senior MET majors are sponsored by local industries and enable our students to establish early contacts with engineers in industry. These relationships often lead to full time jobs for the graduating METs as design/manufacturing/application engineers in industries. The following paragraphs describe in brief a few of the recently completed ‘capstone’ design projects by the graduating class of MET Program. 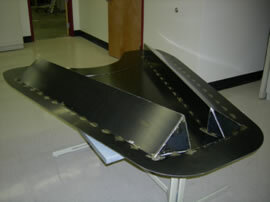 LM WindPower, the manufacturer of large wind turbine fiberglass blades in Little Rock, wanted our students to develop an alternative seal to replace the existing vacuum seal to make the blade fabrication process cost effective. Andrew Bedinghaus, Jeremy Little, and Brad Woodward of the MET Class of 2011 designed, fabricated, and tested an innovative vacuum seal, and successfully implemented their new seal design concept on a large web mold (~150 feet long). 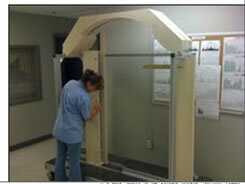 The photographs below show the students working on the project in the laboratory at UALR. Profs. Bakr and Midturi directed the project. This new design has provided LM WindPower significant savings. UALR students have participated (2009 and 2010) in the National Mini Baja Competition. The UALR Mini Baja Car was well-recognized for its innovative design concepts. Although the car did not win, our students brought back a wealth of experience and have set out to correct the shortcomings in their design. The current team of Ben Diggins, Gianni Bardella, and Tony Bardella of the class of 2011 has improved the design significantly, and the new design and upgrades improved the vehicle’s endurance and its ability to take sharp turns, and allowed the vehicle go over serious obstacles such as shallow water, creeks, boulders, and narrow passages with immense stability. The new design is sure to be a winner. Watch the video clip (coming soon) of Gianni driving like a pro and Ben driving so gently thinking that it’s his baby! This project deals with the design, fabrication, and testing of a light duty Four Point Jack that synchronously lifts all four wheels of an automobile for minor repair and service. 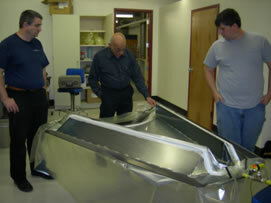 The team consisting of John White, Charles Shank, and Van has transformed its concepts to a fully functional product. 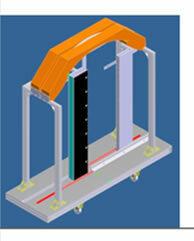 The video clip (coming soon) shows the working of the 4-point jack in its operation. Jon Tyler and Cassie Tipton of the MET class of 2011 worked closely with manufacturing engineers from Falcon Jet Company, an interior retrofit aircraft company in Little Rock, to design a Mid-Cabin Curtain Fixture. This cabin curtain fixture is designed to be installed in a private jet. 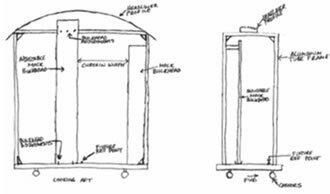 The MET team evaluated several concepts and eventually proposed a creative solution for the design, fabrication, and testing of a mid-cabin curtain. This new design cut production costs by more than half. The enclosed figures below show the hand-drawn concept of the cabin curtain design, finite element model of the design for determining stresses and deflections, and prototype of the mid-cabin curtain for Falcon Jet.